$0 Profits Couldn't Hold Back This Year's Tech Darlings : All Tech Considered In Silicon Valley, zero profit and even zero revenue don't make a company a loser. Tech companies like Snapchat and Twitter, which have not yet turned any profit, can be worth billions of dollars based on future potential alone. Zero. That's the total amount of revenue created by Snapchat in 2013. It's the total profit collected by Twitter. And it's roughly how much Apple's stock price has increased between early last December and now. Which makes you wonder: With all these zeros piling up, how are so many people in Silicon Valley making so much money from technology? "Well, it gets complicated," says Jim Jubak, a portfolio manager at Jubak Global Equity Fund who has invested in Apple and other tech companies in the past. "It's all very, very future-oriented. It's like, 'OK, so where are we going to be in a year?' "
In other words, when it comes to valuing technology companies, profits and even revenue often matter less than what analysts and investors predict about the future: Is the company growing, and how fast? So let's start with Snapchat, the baby of this group. The company is just a couple of years old and lets users send pictures that disappear to friends. It's become widely popular. But it also has, as Anant Sundaram, a corporate valuation expert at Dartmouth's Tuck School of Business, says, laughing: "No revenues, as far as I know." What gives him the giggles is the fact that Snapchat is attracting takeover offers in the billions. "If the rumors are to be believed, there was a $3 billion bid from Facebook for the company and a $4 billion bid from Google for the company," he says. Just to be clear, when Sundaram says Snapchat has no revenue, he means that no one pays the company any money for anything. When I ask Sundaram what it would take for that type of valuation to make sense, I get dead silence. "Um, the reason I am hesitating in replying," he finally answers, "is that I cannot think of any possible scenario under which this kind of a valuation makes sense. ... All I can do is scratch my head." Snapchat didn't respond to a request for comment. Valuations Driven By 'Psychology, Fads, Sentiment'? It's not like Sundaram is a Luddite or some kind of technology skeptic. Just a few years ago, he was widely mocked for arguing that Twitter was worth more than $1 billion. Still, what's going on with startups like Snapchat today is leaving him speechless. Juback, on the other hand, sees an explanation: Facebook's fear. If you are Facebook, nothing can hurt you more than a social media startup that has the potential to knock you off your pedestal, he says. "This is a relatively good investment, because you're talking about a few billion dollars to make sure your company doesn't get blindsided," Juback says. "And in those terms, it makes sense." But Facebook's free-spending ways have created an investment bubble in Silicon Valley, Sundaram says. "Any valuation bets are off, frankly," he says. 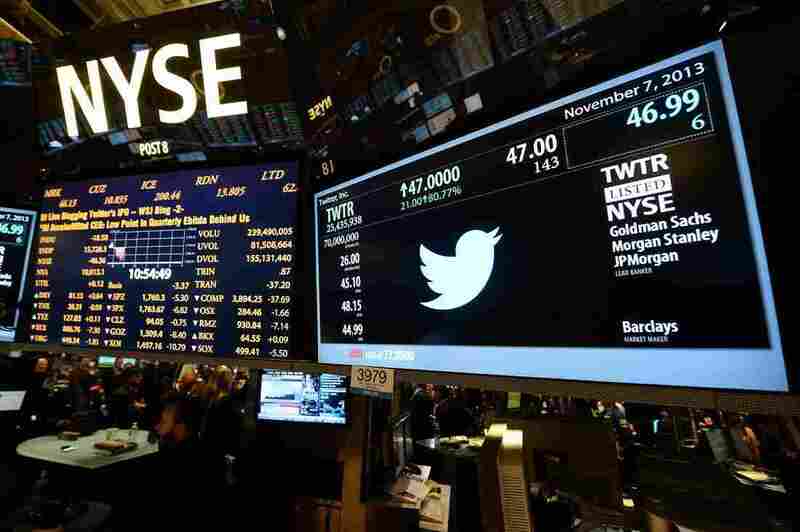 Take Twitter: The company has never recorded a profit. It expects revenue of roughly $600 million this year — but last week it was briefly valued at more than $40 billion. "We are talking about a price that is a substantial overvaluation, relative to the fundamentals," Sundaram says. "And what drives that — who knows? It's psychology, fads, sentiment ... the list goes on." Sundaram says this is a classic bubble — one that may be popping right now. So I asked Jubak to peer into his crystal ball and predict where this investment frenzy is headed. "It's an Apple crystal ball, by the way," he jokes. "It's their next product. We are doing advanced testing." The truth is, even an imaginary Apple crystal ball can't predict the future. And when investment predictions are driven by fortune tellers, they typically fail to make much sense. Just ask Apple itself. That company is on track to bring in more than $170 billion in revenue this year and stands to earn $37 billion in profits — and its stock price has been flat or falling.